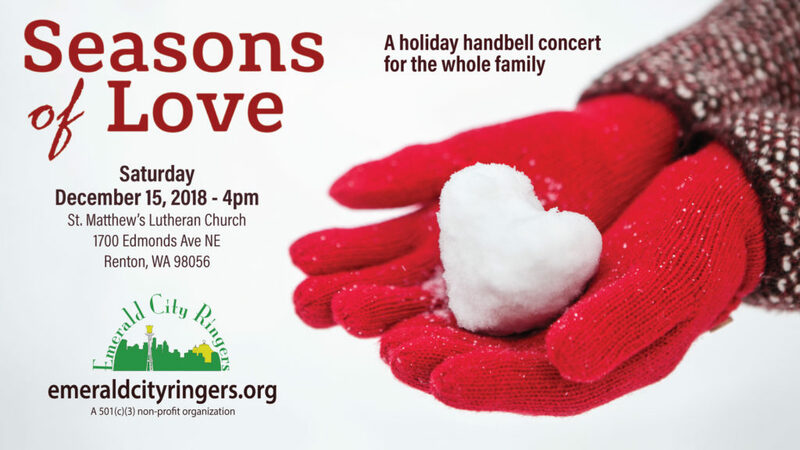 Join Emerald City Ringers for SEASONS OF LOVE, a holiday handbell concert for the whole family. We will return to St. Matthew’s Lutheran Church, 1700 Edmonds Ave NE in Renton, on Saturday, December 15, 2018 at 4pm. Admission to the concert is by suggested donation: $12 adult, $8 student/senior, $5 child, $30 family. For more information, email recruiting@emeraldcityringers.org.